WHILE THE WORLD was in the death grip of the worst economic depression in history in the summer of 1934, fascist Italy hosted the second FIFA World Cup in what remains the only edition where the host nation was required to qualify. Although the concept would be unthinkable today, worldwide competition was still a young phenomenon; politics would play a critical role, and several nations did not participate for a variety of reasons. In the early years of international competition there were many disagreements over the status of amateur and professional players, who was affected, what tournaments they could play in, and even whether or not tournaments would take place at all. In 1932 the organisers of the Olympic Games in Los Angeles abandoned the very idea of a football competition due to arguments over what exactly constituted amateurism. 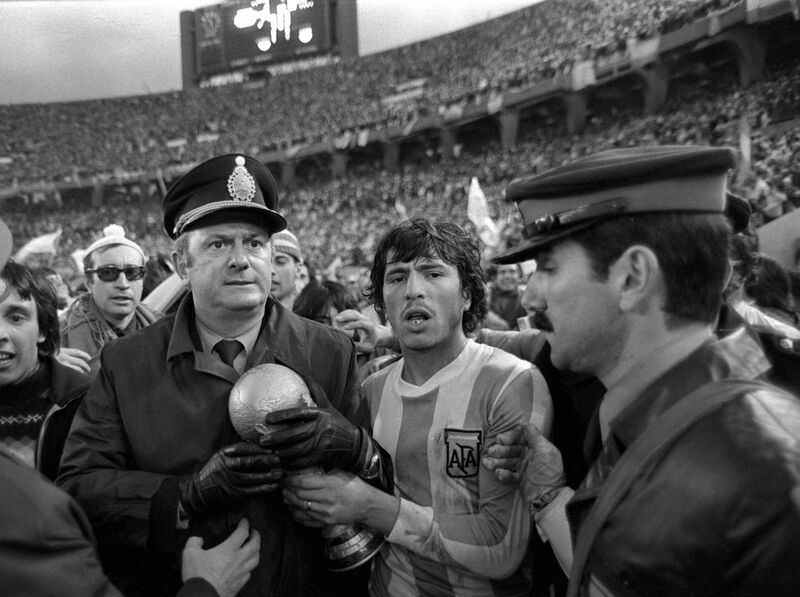 Uruguay, who had hosted and won the first World Cup, refused to even defend their crown four years later as they were offended by the European countries that had declined to travel to Montevideo for the first Cup and felt their country was being disrespected. They returned the snub and to this day they claim more world championships through their earlier wins in the Olympic games of 1924 and 1928, the most recent games before the initial World Cup, which were also organised by FIFA. To complicate matters even further the Home Nations of England, Northern Ireland, Scotland and Wales refused to compete in Italy citing their “busy tournament schedule at home”. 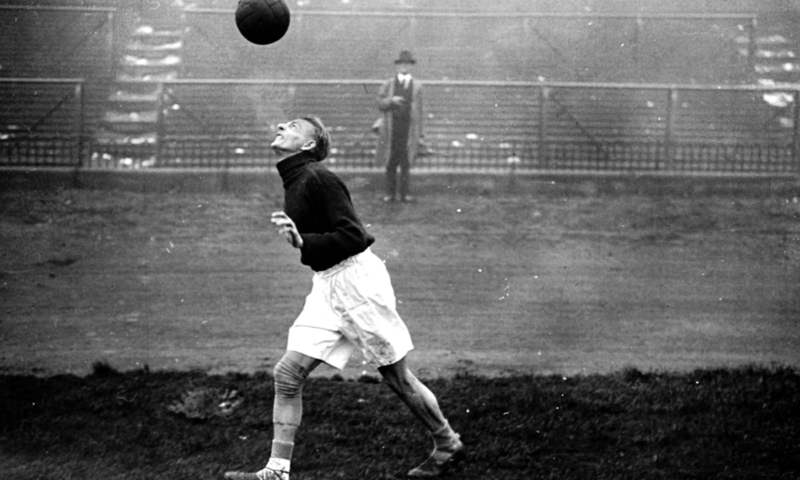 The Home Nations Championship took precedence over the nascent World Cup in 1934, with the UK at the forefront of the battle between professionalism and amateurism in the sporting world. Fascist newspapers reprised the colonial air of superiority by referring to this period of self-imposed exile from the footballing world as England’s “splendid isolation”, just as Benjamin Disraeli had directed foreign policy under the same phrase 60 years earlier. The 1930s were the decade of fascism in Europe. Italy was the standard-bearer for this new form of government; Benito “Il Duce” Mussolini was leading the nation into uncharted territory with his relentless propaganda machine, and the promotion of football as a patriotic symbol of their superiority was espoused. Whether or not fascism played a big part in the development of football players in questionable, but it certainly played a major role in the building of stadia and mass transport for the tifosi to attend matches. Mussolini himself was a follower of football and saw its power in communicating to the common man. He was purported to hold a theory that the brutal Italian game known as Calcio Fiorentino, which is traditionally contested in Piazza Santa Croce in Florence by groups of lightly armed men who fight their way through one another to score a goal utilising hand to hand combat and brutality, was the true inspiration for modern football. He went as far as to have a documentary broadcast on radio about the “true” origins of football in Italy from the 16th century just before the final. The selection of Italy as the host nation was fraught with political intrigue and rumours of intimidation and illegal payment, but FIFA itself was already under scrutiny as an organisation with less-than-pure sporting ideals. As early as 1930, an informal lobbying effort was undertaken by the Secretary for the Italian Football Federation, Giovanni Mauro, on behalf of the fascist government to assure the organisation that the Italian government would underwrite any losses incurred during the tournament. This, more than anything, swayed the committee to grant Italy the Cup over rivals Sweden, the only other serious competitor. Achille Starace, who was known as the ‘High Priest of ‘The Cult of Il Duce’, was to be the face of the competition. A close confidant of Mussolini, Starace was the creator of much of the most important propaganda of the fascist regime, including the fascist salute itself. Starace was to make the World Cup so ubiquitous that everyday Italians were bombarded by fascist iconography, over 300,000 posters, stamps issued with World Cup images, and even a cigarette brand Campionato del Mondo, or World Championship. Back in the UK, where the denizens referred to themselves as the ‘Home Nations’, their view on the 1934 World Cup was less than bright. They considered the annual Home Nations Championship the real world championship, and they would exclusively control the definitive laws of the game up until 1958. England were represented in international football by a true character of the game, Charles Edward Sutcliffe, who among other distinguished accomplishments was the founder of the Referees’ Association. Sutcliffe was against the very idea of FIFA and had commented that the “one country, one vote” system had led to “magnifying the midgets”. His time at the FA led to a self-imposed exile from FIFA that started in 1928 and did not truly end until after the war. For the 1934 World Cup, Sutcliffe was to have none of it, proclaiming that the “Home Nations was a far more representative World Championship than what is taking place in Rome”. The fascist regime was not concerned with who would show up and who would stay home, as their concerns were internal. They wanted to highlight the superiority of the Italians in their domestic markets, and if that meant that England – who were a very good side in 1934 – were going to sit this out, all the better. Although Uruguay did not have a problem with Italy directly, their complaints were with FIFA itself, and the fact that so few European sides had entered the 1930 World Cup. Having those two giants out of the tournament before it started would suit Mussolini’s goal: an Italian World Cup victory. Then there was the matter of qualification. Thirty-six teams had applied for inclusion in the second World Cup, but only 16 spots were to be given to enter a straight knockout with no group stages. These places were to be taken by 12 countries from Europe, three from the Americas (this was before the formation of UEFA, CONCACAF and CONMEBOL) and a single entrant from Africa. Egypt would fill that role to become their continent’s first competitor in a World Cup. Their participation came about partly by default after having been placed in group 12 along with Turkey and Palestine, whose squad was made up of nine ex-pat Brits, six Jews and one Arab. The side was referred to as “Palestine, British Mandate” and is considered the forerunner of the Israeli national team, not that of the Palestinian Authority. Egypt played two qualifying matches against them and racked up an aggregate 11-2 scoreline. Turkey abandoned their attempt to qualify before even playing a match. Several federations still had qualifications to be settled in the weeks leading up to the finals. A mere three days before the start of the competition there was one final qualification match to be held between Mexico and the United States in Rome to decide the final spot, with the United States winning the match 4-2. In the South American contingent there were more countries that abandoned qualification as Peru and Chile withdrew out of solidarity with Uruguay, which allowed Brazil and Argentina automatic entry to the finals. Italy qualified by beating Greece 4-0 in a match that featured the single cap for the great Milan manager Nereo Rocco, a requirement at the time to become a manager in Serie A. After the humiliation of the initial defeat, Greece withdrew their application, gifting Italy passage to their own tournament. In Group 2, which was made up of Spain and Portugal, Spain scored 11 goals over the two matches to the single goal that Portugal managed. In the first match, the great Basque striker Isidro Lángara had scored five goals in a 9-0 victory. Lángara scored 281 goals in 220 matches for Oviedo and also won the Pichichi award for top scoring in the Spanish league in 1935 and 1936. A true legend of La Liga, Lángara only managed to play a single match for his childhood favourites, Athletic Bilbao, due to the Spanish Civil War. In addition to having the first host nation that had to qualify, the 1934 World Cup was unique in that the reigning champions did not attend. The representatives of the Americas were the United States, Argentina – who had lost in the final match of the 1930 World Cup to Uruguay, and also had the Golden Boot winner from that tournament in eight-goal Guillermo Stábile – and Brazil. Due to the odd number of entrants for the first World Cup, the Brazilians’ 2-1 defeat to Yugoslavia in their three-team group proved fatal since only the winner of each of the four groups made it to the semi-finals. The great day, 27 May 1934, was fast approaching, and the fascist propaganda machine was in full motion. All 16 teams were set for an eight-city simultaneous kick-off that was to be a grand pan-Italian extravaganza. The cities that had been chosen to host this event were carefully selected for optimal effect to promote the Italian ideals. Fascist architecture was promoted at many of the locations where new stadia were built and in other cases existing venues received a facelift from the government. One stadium that was upgraded for the World Cup was the Stadio Giorgio Ascarelli in Naples. Originally named the Stadio Vesuvio, the stadium was built in honour of the industrialist Giorgio Ascarelli, and was subsequently renamed Stadio Partenopei for the World Cup. Several years later the stadium was completely destroyed by allied bombing and there is now housing where it once sat. In Turin, where Mussolini felt his greatest connection to the game of football, the Stadio Olimpico Grande Torino was built for the 1933 World Youth Games, after which the name was changed to the Stadio Benito Mussolini. There were eight seeded teams – Argentina, Brazil, Germany, Italy, Holland, Austria, Czechoslovakia and Hungary – who were kept apart in the first round of competition based on the FIFA rankings. For the first time a World Cup was to be held where fans could travel to the site and cheer for their home country. While Mussolini wanted to put on his best face for them, he also wanted to show his guests – especially the European nations – that fascism was the way of the future, to show how happy the people of Italy were, and how organised the games could be. This was part of the reason for the simultaneous kick-offs – to show that Italy could pull off eight major football matches at once, without skipping a beat. The obvious downside of having a straight knockout international tournament was that half the teams that travelled to Italy would be eliminated after a single match; for this reason the World Cup has unsurprisingly never again been held in this fashion. The United States had the ignominious honour of playing the hosts in the first match of the tournament and being crushed 7-1 – and they were said to have had the fine goalkeeping of Julius Hjulian to thank for keeping it to just seven. While the Americans returned home well and truly chastened, it was clear what was expected from the hosts. General Vaccaro, President of the Italian Football Federation, claimed that Italy had shown its “cordial hospitality, discipline, and organisation”, especially with regard to the visiting fans who had travelled to Italy for the event. One issue that plagued the tournament was the attendances at matches outside of the final itself, which was not helped by the fact that eight venues across the country – compared to 1930’s single-city tournament – meant fans were spread thinly. Mussolini made a big performance over purchasing his ticket to the opening match himself, then proceeded to take his place among the honoured guests in the tribuna d’onore with the royal family and other dignitaries. Mussolini wanted to be seen as the man of the people, standing in queue to get his ticket to the “People’s Cup”. It was the first major tournament to be broadcast widely on the radio, and while individuals were not as likely to own a radio in Italy as they would be in Germany or Holland, who had each procured rights to broadcast the event, it was very common for Italians to gather in communal places to listen to major broadcasts. The World Cup did see a rise in individual ownership of radio sets, but Italy still paled in comparison to other European nations. After the low turnout to the initial round of matches the fascists began to redouble efforts to get fans to the stadiums. When they could not fill the stands the radio broadcasts would still comment on how full the stadiums looked and how the workers had come out to see their heroes play for the people and the party. Italy had got off to a great start with their victory over the United States, but they weren’t the only prominent team to succeed in the first round. 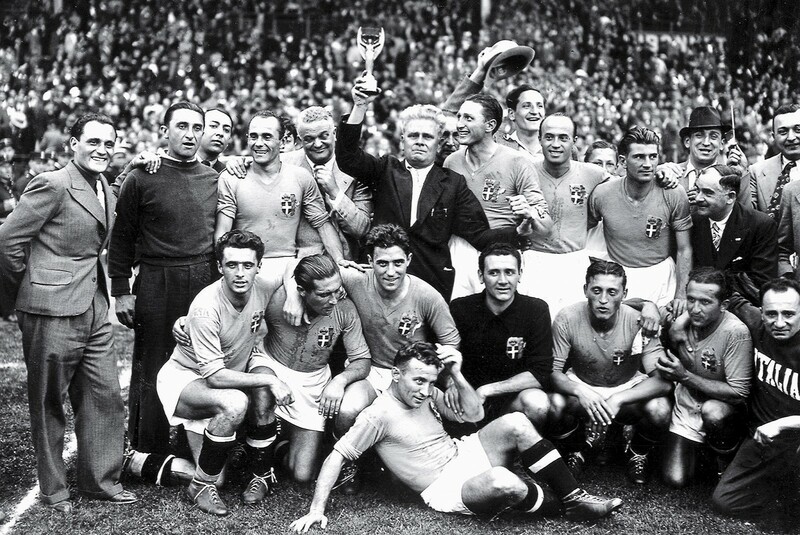 Sweden had been victorious over 1930 runners-up Argentina in front of 14,000 in Bologna, thus sending the Argentines home after playing only a single match on Italian soil. Germany, thanks to the hat-trick of Edmund Conen who was making his international debut, had beaten the Belgians in front of a sparse crowd at the Stadio Giovanni Berta, the stadium in Florence which holds over 47,000. Conen ended the tournament as second-leading scorer with four goals. The most well-attended first round match took place at the San Siro where the mighty Swiss played out a thrilling 3-2 victory over the Netherlands in front of 33,000 fans, many travelling from their home country to see the match. The quarter-finals were set with only European sides advancing. The hosts faced Spain in what would become the controversy of the tournament while Austria would meet powerhouse Hungary, Czechoslovakia drew Switzerland, and Germany would take on Sweden, the rising star of the north. Striking the tone of their “splendid isolation”, English papers sent no reporters to Italy to cover the World Cup. In fact there was no coverage at all; not even scores in the newspapers or purchased newsreel footage. The reach of the fascist propaganda was limited to Italy itself, since even in Germany and France, who were competing, the coverage was limited, with only Spain seeing fit to cover the events in any detail. The quarter-final match between Italy and Spain has become a legendary game that was known for its brutality and fierceness, as well as the potential for referee mishandling and possible corruption. There had been rumours of referee malfeasance in the lead up to the finals in several of the matches, yet nothing has ever been ultimately proven either way. 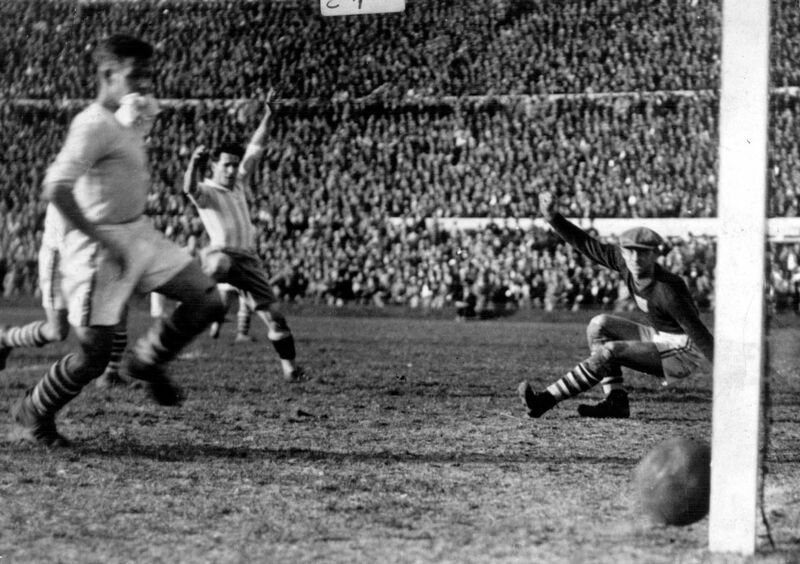 Ricardo Zamora, the legendary Spanish goalkeeper, was injured in the build-up to the Italians’ equaliser, and has since been quoted as having said that the match between Italy and Spain should “have been for the final … we were the best teams”. There were a large number of violent acts perpetrated by both sides. Several players had to be stretchered off the field and one Italian player, Mario Pizziolo, who broke his leg in the match was never able to play for the Azzurri again. The clash ended in a 1-1 draw, which by tournament rules meant an immediate replay. La Roja would have to play without their talisman, captain and starting goalkeeper Ricardo Zamora, but the Azzurri were also shorthanded with the loss of Pizziolo. The match was set for the next day, 1 June, at the Stadio Giovanni Berta in Florence. Italy were prepared for another rough, physical test against the Spaniards, who had to bring in the back-up goalkeeper, plus cope with the pressure of playing in front of the hierarchy of the fascist regime. It proved too much as they succumbed 1-0 to their opponents in another violent encounter. When the semi-finals came it was the Austrian Wunderteam of Matthias Sindelar, who had finished off the Hungarians in the quarter-finals, that faced the Azzurri. In the other semi-final Germany, who had beaten Sweden in the previous round thanks to a three-minute second half brace by Karl Hohmann, would face the mighty Czechoslovakia. The semi-final match between the Czechs and the Germans was fraught with controversy. The Italian referee, Rinaldo Barlassina, an experienced and loyal referee, was seen by many to have steered the match towards a favourable outcome for the weaker Czech side. Knowing that an Italian would not be refereeing the final match, Barlassina wanted to see the Azzurri face the weaker side in the final. The Italy versus Austria match was another physical and tight match, which didn’t suit the Danubian passing style of the lightweight Sindelar – known as the ‘Paper Man’ for his physique – and his team-mates. The match took place at the San Siro in Turin in front of 35,000 fans, many of whom had come from Austria to cheer their side, but it was Italy that was destined for the final. The Austrians couldn’t break down the tough Italian defence despite their famous technical style, and the final was set: the Azzurri would take on the Czechs, while Germany would meet Austria in the third place playoff, less than four years before Hitler would declare Anschluss. In a move that infuriated Mussolini, on the day of the final Czechoslovakia made it official that they would be allied with the Soviet Union. The communist pact was seen as an anti-fascist move and a symbolic gesture of the duelling political philosophies. Many communists in Italy had been suffering under the fascist regime, so to many the final was seen as a manifestation of the struggle between the forces of Communism and Fascism. The day of the final arrived. Il Duce and all the high-ranking officials of the fascist party were in attendance, as were representatives of Nazi Germany, and communist Czechoslovakia. Germany had won the third place match the day before, and in an Olympic-type ceremony scheduled for after the final there were to be three teams celebrated. The final was held in the Stadio Nazionale in Rome. Even though Mussolini’s power base was in northern Italy, he had consolidated the south and even made strides in the Kingdom of Naples. Reunification was theoretically complete under the leader, even though he paid little attention to the poor in Calabria and Sicily. Some 65,000 attended the final, though reports and pictures from the final show that despite the propaganda machine saying how packed the stadium was with workers and party members, there are clearly empty portions in the stands. Some historians claim this is due to the waning influence of Mussolini in southern Italy; others say that it was simply a matter of the match taking place in the summer heat in Rome, where it can be very uncomfortable at times. The match itself was a real cracker for the purists. A tight, physical battle remained goalless until the last 20 minutes, when the visitors grabbed a shock lead which threatened to undermine the fascists’ show. Chances were rare, but Raimundo Orsi’s late strike took it to extra time. It was not until the 95th minute that Italy broke through for the winning goal from Angelo Schiavio, a legend of calcio who spent his entire 15-season professional career at Bologna before going on to manage the club. Schiavio ended the World Cup as the second top goal-scorer, behind Oldřich Nejedlý of Czechoslovakia. Nejedlý was a hero in his native land where he played for Sparta Prague, scoring 180 league goals in 225 games, and although he went on to play in the 1938 World Cup, he broke his leg and never played football again. After the final there was a ceremony where the fascist anthem Giovinezza was played and the presentation of not only the Jules Rimet trophy, but also the special cup which Mussolini had commissioned, six times larger than the World Cup itself, was presented to the Azzurri. The denouement of the 1934 World Cup was to take place four days after the final kick on the field of play. A historic meeting took place in Venice between Adolf Hitler and Benito Mussolini, the first time the two leaders had ever met, and it was the beginning of the Axis that would make up the power base of continental Europe and set in motion the deadly events of World War Two.